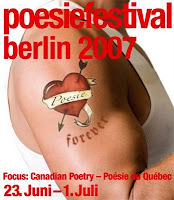 Lyrikline.org, the online companion to Berlin's Literaturwerkstatt, the brains and brawn behind the annual Berlin Poetry Festival, have finally posted the poems and recordings by myself and my fellow Canadian poets, both anglophone and francophone, from last year's festival at the Kulturbrauerei in Berlin. All the poems come complete with audio recordings. My poems consist of five poems from my book Between the Walls and five new poems. You can read, and listen to, my poems here. You can also enjoy the poems of Anglophone poets Karen Solie, Ken Babstock, Suzanne Buffam, Tim Lilburn, and Erín Moure, and also of our Francophone compatriots Stéphane Despatie, Hélène Dorion, Louise Dupré, Claude Beausoleil, Marc André Brouillette, and Denise Desautels. It's nothing new, and it’s not just our Karl-Rove-esque, culture-bashing Prime Minister Stephen Harper. Canadian Conservative politicians have had it in for the arts for a long time, as poet Al Purdy found out way back in 1981. Below is an excerpt from Purdy’s memoir Reaching for the Beaufort Sea, published by Harbour Publishing in 1993. Purdy had been to the Galapagos Islands and was charmed by the wildlife enough to write some light-hearted poems about them. Needless to say, the Tories weren't impressed. I was completely unaware of this cultural occasion in the legislative chambers. Its later repercussions only came as a surprise to me. And here is the offending poem. I just love the ending. --Al Purdy, 1981. Used with the permission of Harbour Publishing. All rights reserved. From Reaching for the Beaufort Sea by Al Purdy, Harbour Publishing, 1993.